After spending 3 great days in Damascus was it time to travel north to Aleppo, driving along the world´s most dangerous road, the Salamiyah – Ithriya – Khanasser Road, notorious for being attacked by Daesh (ISIS) and Al Qaeda, and getting shut down for days. And yes Daesh (ISIS) attacked the road the same day I travel it as well, less than 1hour after I passed by it. An old burned out bus, you pass a lot of old destroyed vehicles on this road, even two tanks, military trucks, and a few oil tankers. 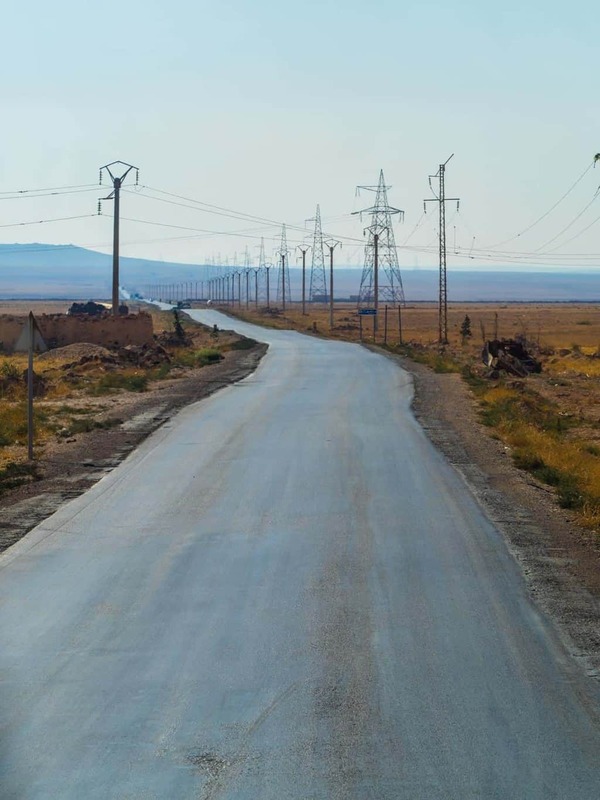 The road between the two biggest cities in Syria used to take only 5 hours to drive, however, these days it will take you between 7 to 9 hours.It´s now really easy to visit Syria, click here to read about travel guide about how to get the visa in less 48hours. Watch this 3min long video that I filmed with my GoPro during my trip to Syria. 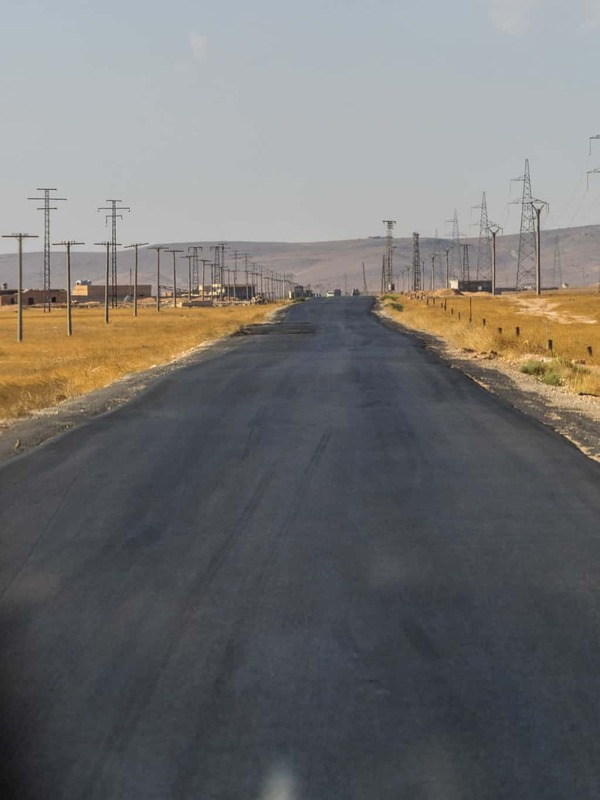 Mostly because of the detour you have to take along Salamiyah – Ithriya – Khanasser road (The highway is off limits since it goes through deep Al Qaeda land), and there a few compulsory military checkpoints with friendly soldiers who do papers checks. This rarely takes more than a minute or two. Getting close to Aleppo now. Local kids posing for a photo when having a fast drink stop. 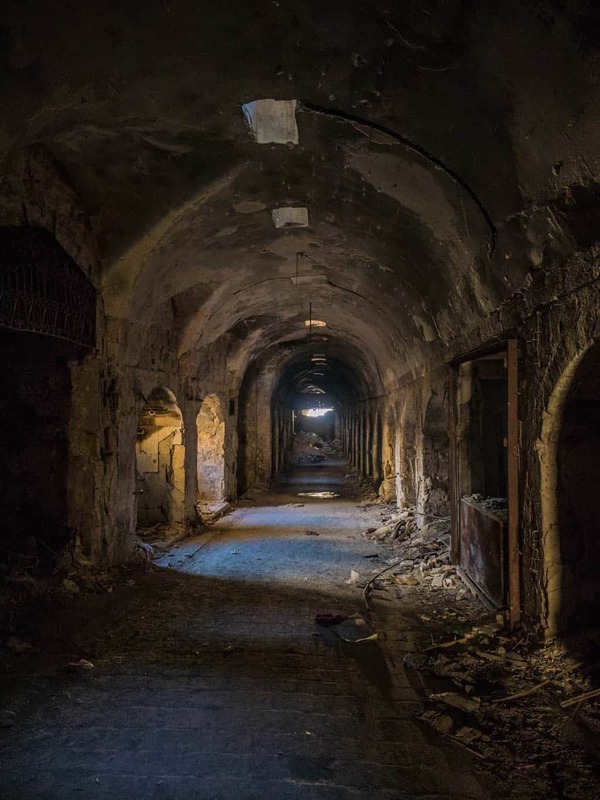 When you finally reach Aleppo, you will go through the broken parts of East Aleppo, the places where some of the most fierce battles in the war happened. 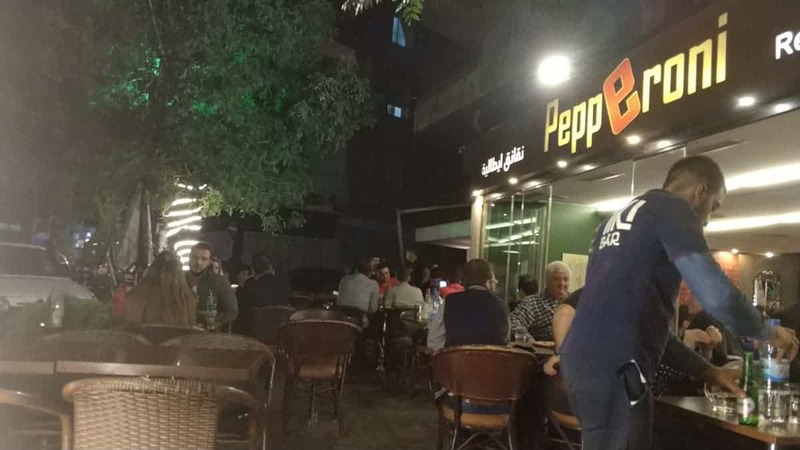 But it doesn’t take long before you notice that only a small part of Aleppo is destroyed, as soon as you reach central Aleppo, the city is bustling with life, just like Damascus. So too are the shops, restaurants, supermarkets, and parks filled with people. 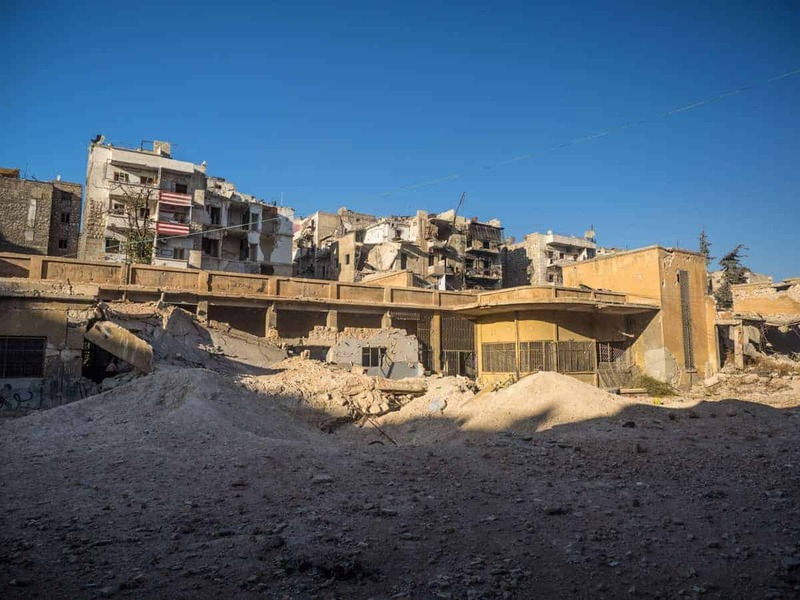 Yes, There´s a lot of destruction in Aleppo, especially the historical old part of town with the Souq (market) and surrounding areas are mostly destroyed, but rebuilding has already started. But there’s far less destruction in Aleppo than what the media has been telling us, only about 20% of Aleppo is destroyed or damaged. The city centre is mostly unharmed. The university is open together with 913! schools, the local trains are running and there are seven public transportation routes around the city. Aleppo Trains station, there’s a local train running, the station opened in 1912! On the 25th of January 2017, train services resumed in Aleppo for the first time in four years. 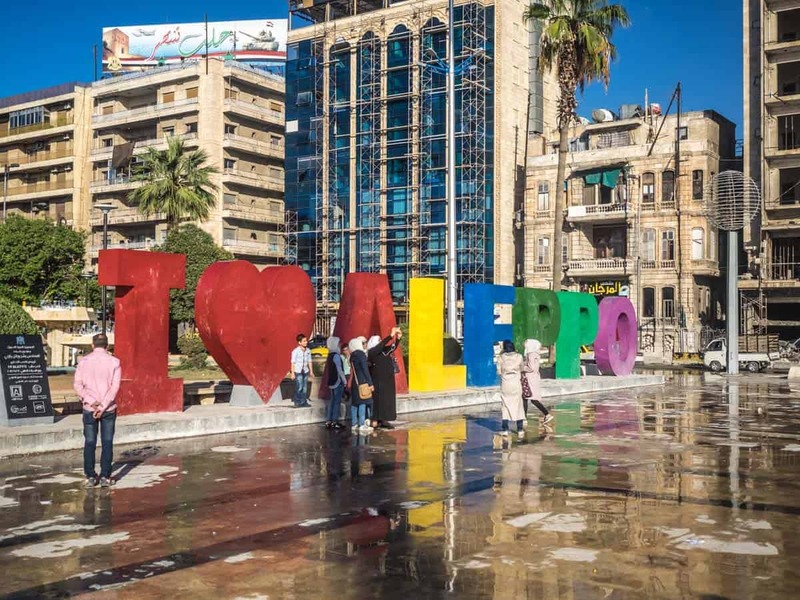 The I Love Aleppo sign is a popular selfie spot for locals, notice the rebuilding of the hotel in the background. As a foreigner in Aleppo, you may think that big parts of the city were off limits? Not at all! 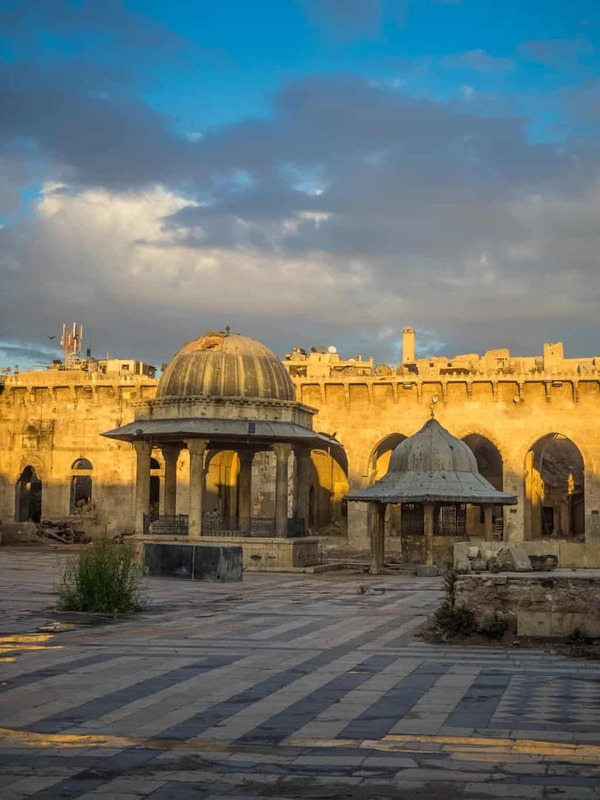 I was granted full access to inside the Aleppo Citadel, to walk around the old Souq, visit the devastating remains of the historic Umayyad Mosque, and to visit East Aleppo. I was even allowed to visit a school that Desh (ISIS) and Al Qaeda used as headquarters. Not what you expect to see in Aleppo? An American Sports car and a palm tree-lined boulevard. 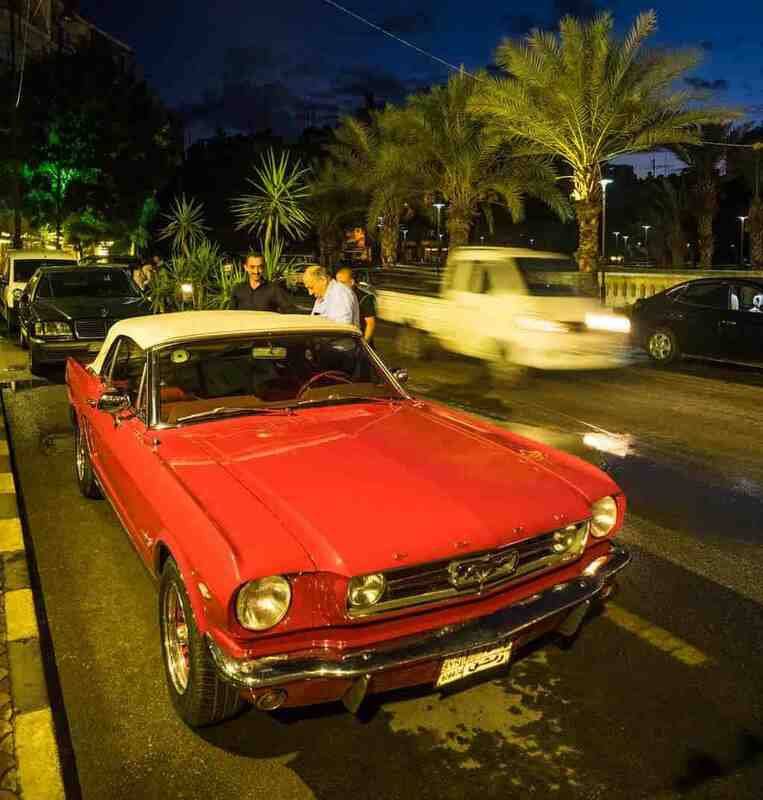 You do see a few American sports cars around the streets of Aleppo. 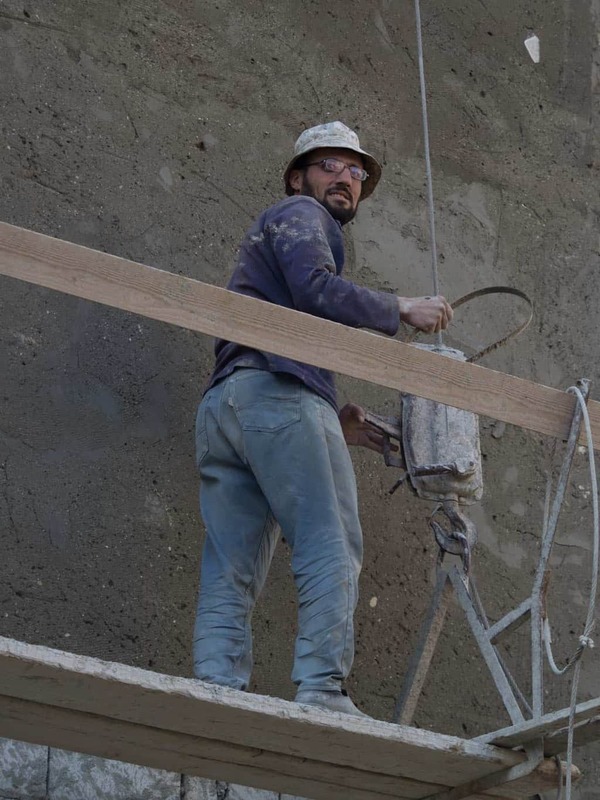 Rebuilding is happening all over Aleppo. I was never told that I could not visit an area, or even told that I wasn’t allowed to take photos! 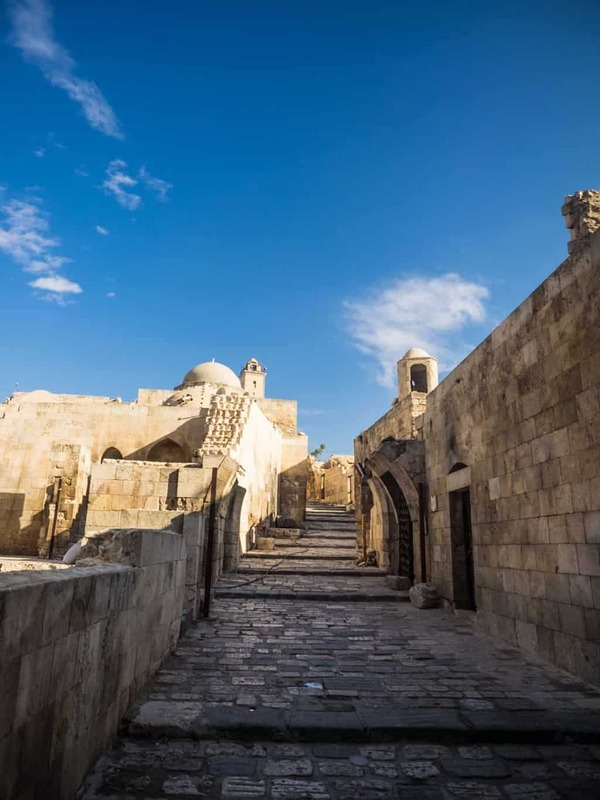 Before the war in the Old City of Aleppo is one of the highlights of every trip to Syria, it was even added to the UNESCO world heritage list all the way back in 1986! 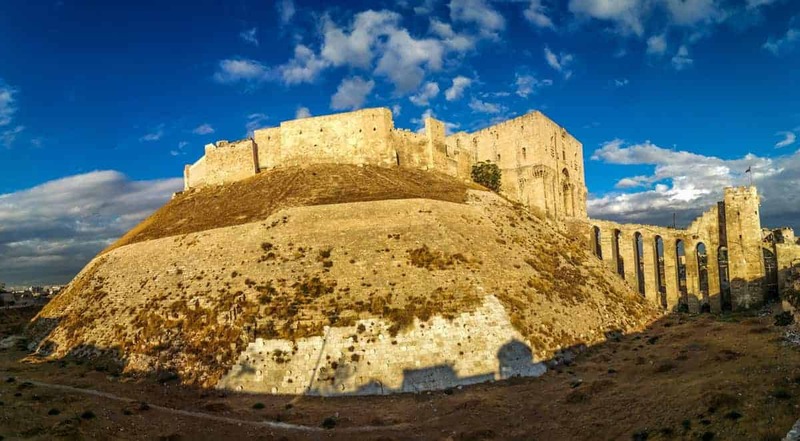 The Aleppo Citadel from the eastern side. 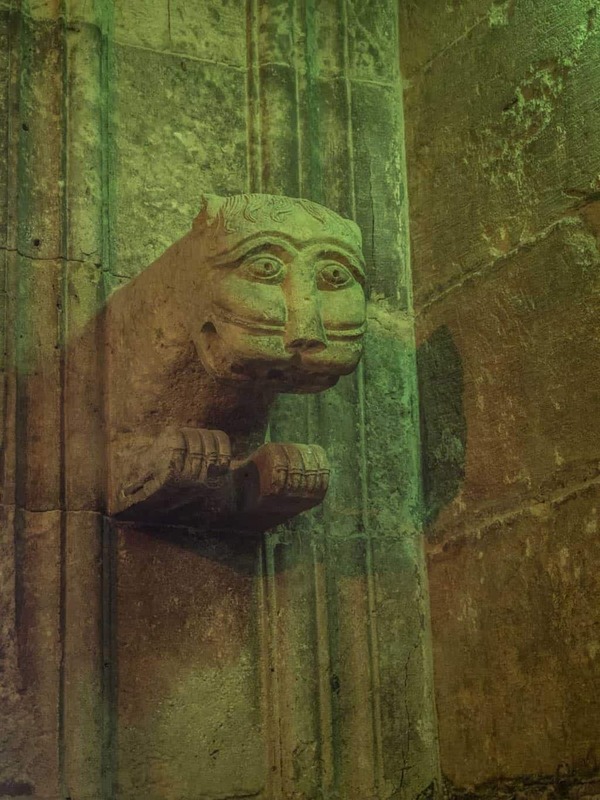 There´s tons of photos from the Citadel further down on this post. Me leaving the Citadel, I’m probably the most obvious looking tourist in all of Syria. Notice that the restaurant on the far right side of the photo is open again! 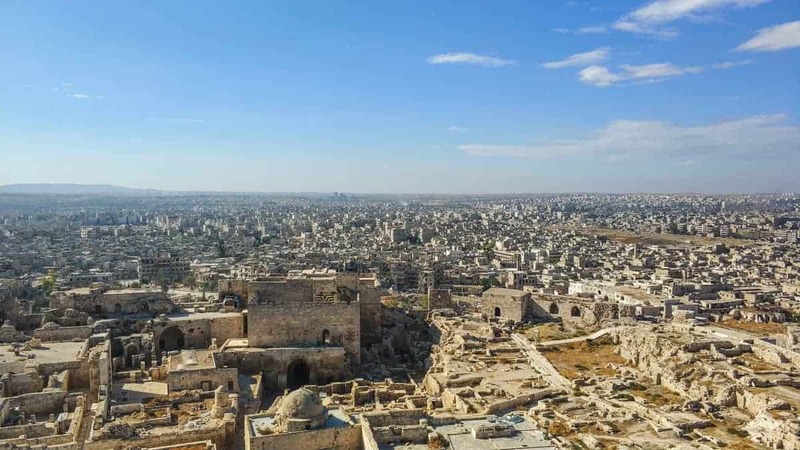 Located at the crossroads of several trade routes from the 2nd millennium B.C., Aleppo was ruled successively by the Hittites, Assyrians, Arabs, Mongols, Mamelukes and Ottomans. The 13th-century citadel, 12th-century Great Mosque and various 17th-century madrasas, palaces, caravanserais and hammams all form part of the city’s cohesive. 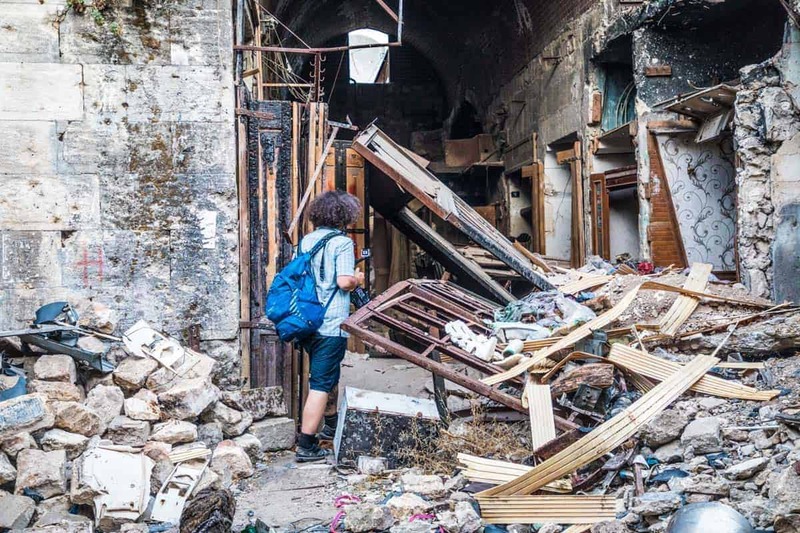 It´s heartbreaking to walk around the Old City of Aleppo and see all the destruction that happens here. But where´there´s sorrow, there´s hope. 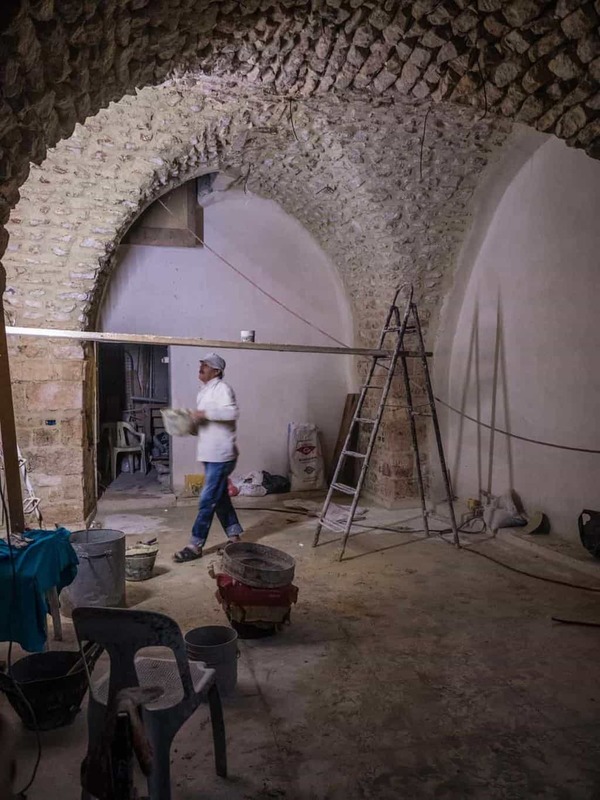 A few shopkeepers in the old Souq are working every day and night to rebuild (in the original style) and reopen their shops and there are stonemasons working at the entrance of Aleppo Citadel, the jewel of the Middle East. The Remains of The Old Souq. From Inside the Souq, most if it looks like this part. But luckily so are some parts of the Souq almost untouched. 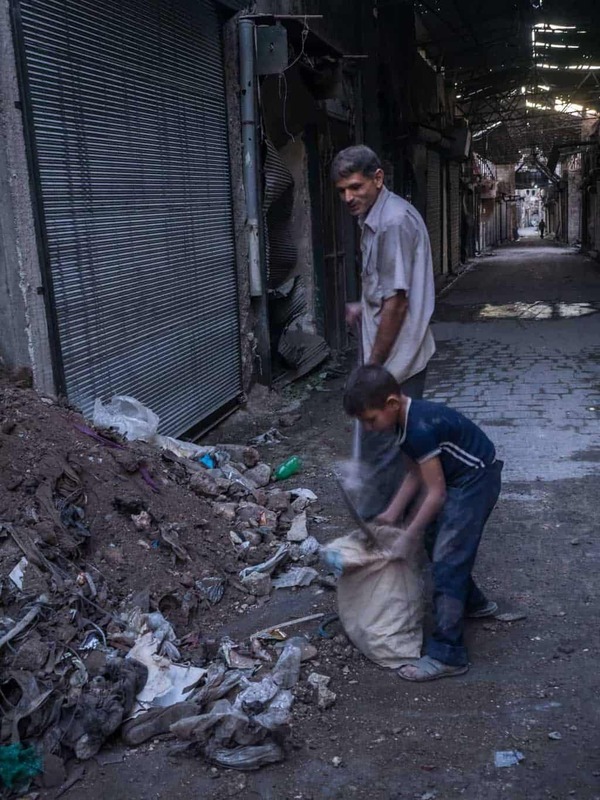 Father and son cleaning out the damage to their shop in the old Souq. Some shops are almost rebuilt, notice that it’s rebuilt in the original style. 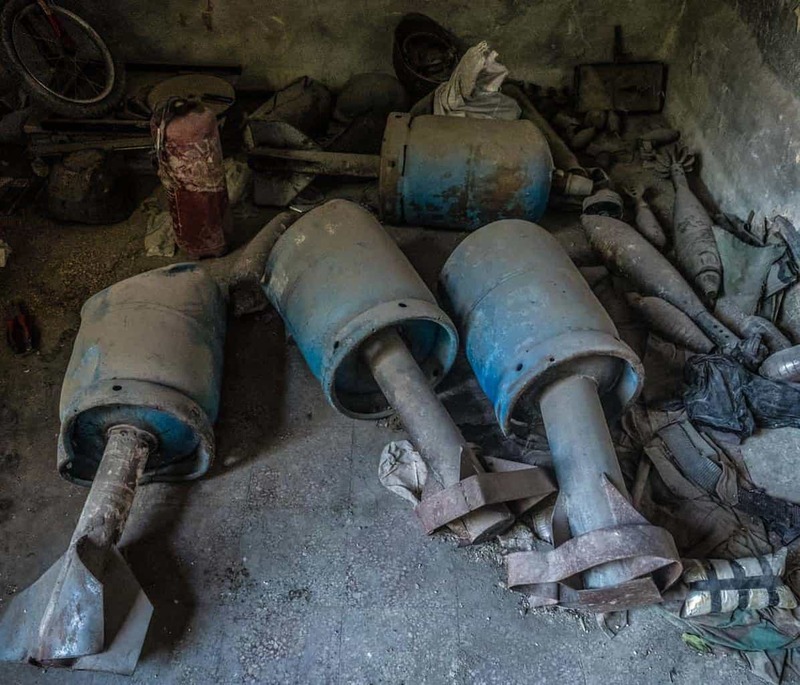 But when exploring, you have to be careful, here there is left behind hell canon bombs from the terrorists. 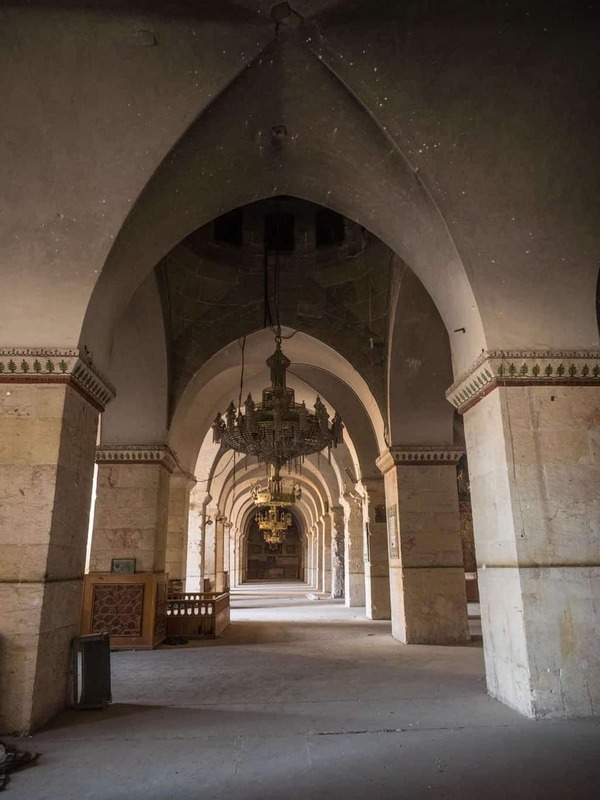 Umayyad Mosque, The Great Mosque Of Aleppo. 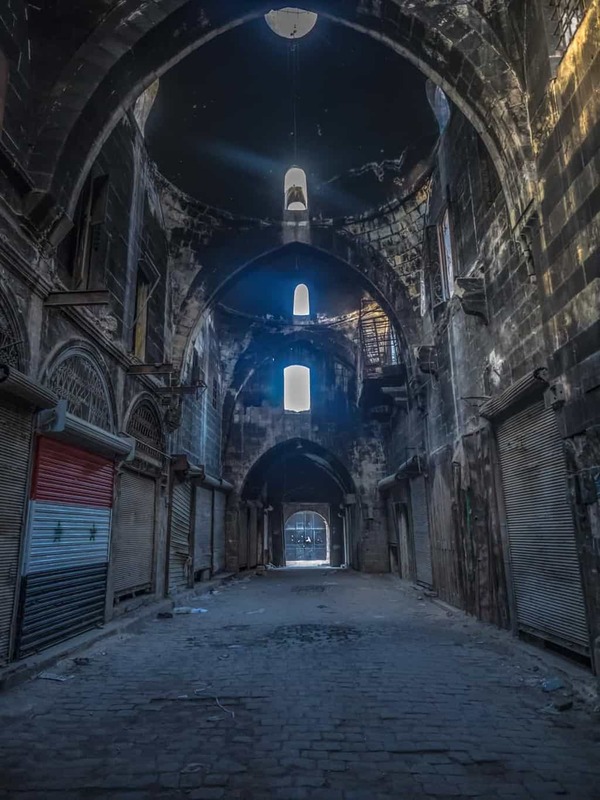 The Umayyad Mosque was the largest and oldest mosque in Aleppo, it dated back to year 715 and was one of the most beautiful mosques in the world especially because its minaret was considered to be a national treasure, but unfortunately, it was blown up in on 24 April 2013 by Al Nusra (Al Queada). The whole mosque is now planned to be rebuilt and restored to its former glory. The courtyard, the Minaret used to be at the back left corner. There´s less damage inside then I feared. The Citadel was a proud treasure for the whole of the Middle East before the war. It is considered to be one of the oldest and largest castles in the world. Usage of the Citadel hill dates back at least to the middle of the 3rd millennium BC. It has been used by and survived through many of the greatest civilizations in history, from the Greeks, Romans, Mongolians to the Ottomans and it´s still standing now after the war. It´s badly dammed inside but restoration has already started. And it shouldn’t take many years before its back to its former glory and open once again to hoards of tourists. I was granted full access to inside the citadel. 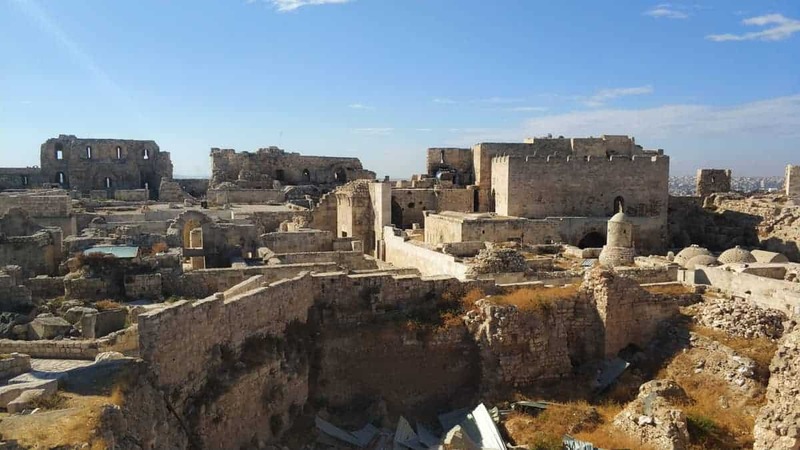 Aleppo Citadel from the western side. School kids are back visiting the Citadel, Girls choose themselves if they want to cover their hair or not in Syria. School kids are back visiting the Citadel. 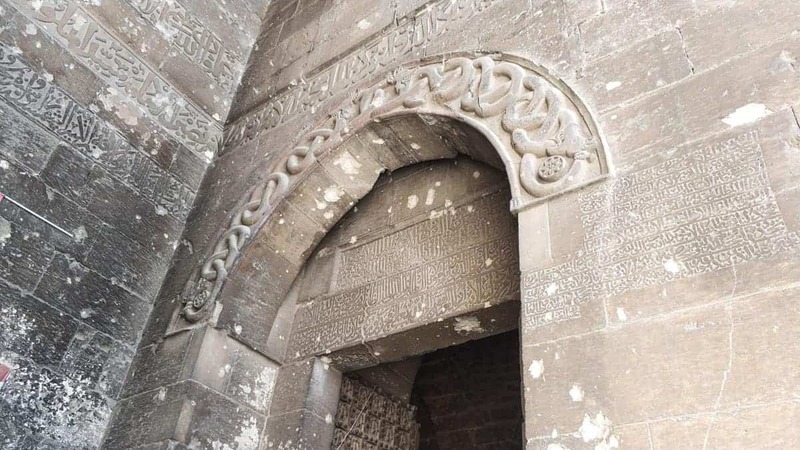 The inscription over the Entrance gate is undamaged. The lion statue at the entrance is undamaged. The place where some of the oldest excavation has taken place. The mosque inside is not damaged too badly. The view from the top of the Minaret to the mosque. Daily Life In Aleppo Ala 2017. 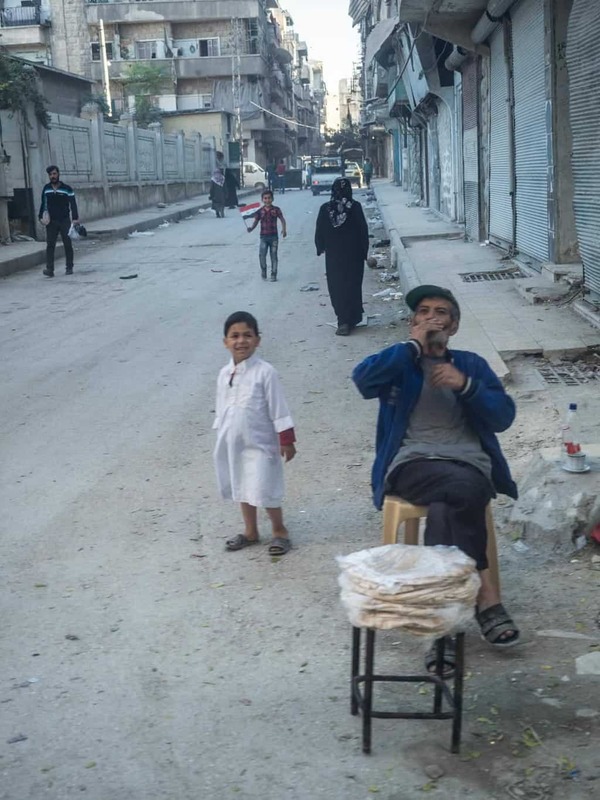 The daily life in Aleppo these days is very normal once again after the government regained control over the city. While walking around central Aleppo will you wonder if there ever was a war happening here. Couples are out shopping and enjoying a shisha in public, young girls are dancing in the parks. “No freedom,” the media tells us. 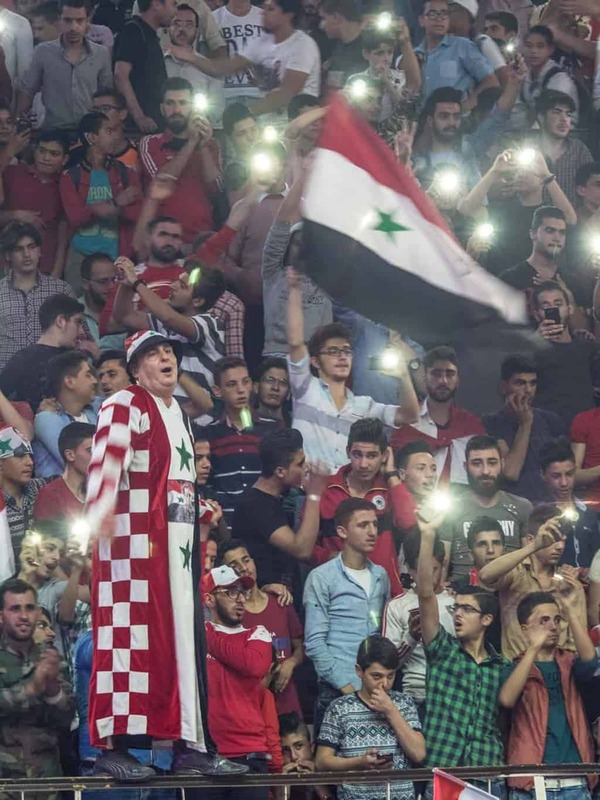 During Syria´s national football time, everyone gathers to watch it. 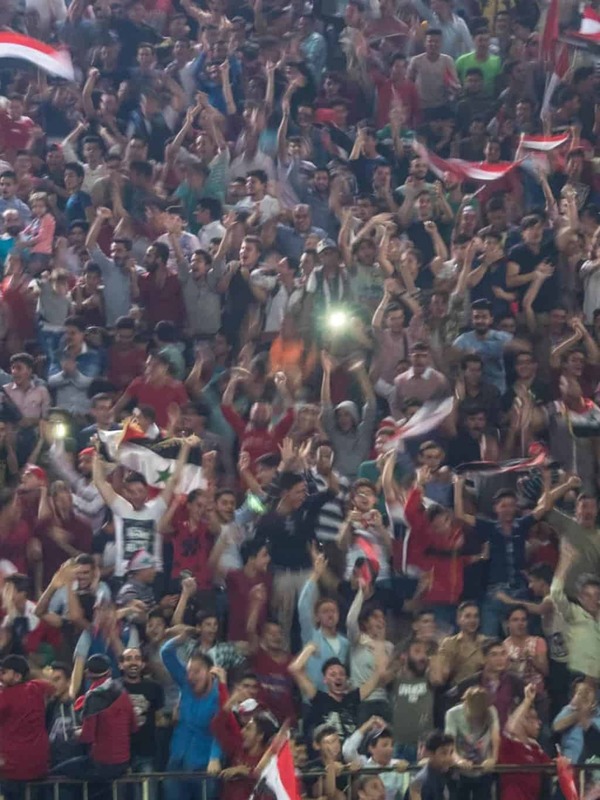 I watched the football game between Syria and Australia at a public watching inside a basketball court. Beautiful girls love football too. Locals enjoying pizza and beer. The most destruction is located in this area, but even here have rebuilding begun, and we all remember reading about the last school that got bombed? 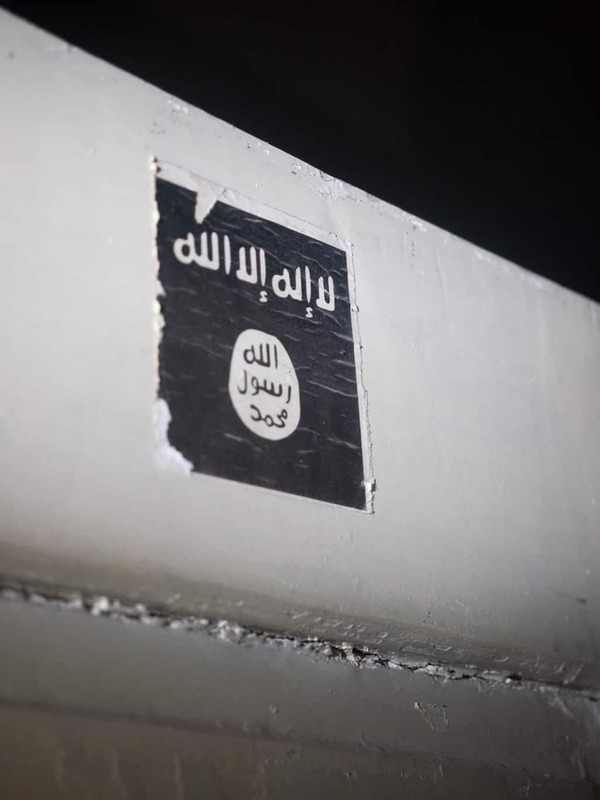 It looks like a normal school, to walk down to the basement and see ISIS flags. Streets of the Eastern part of town, people caring building material back home. That´s how a school looks like after it got hit by an airstrike. But the school was used by ISIS as a headquarters. So do you still think Aleppo is a city in ruins? I have some hundred more photos from my visit to the city, and I will be posting more photos in the near future. 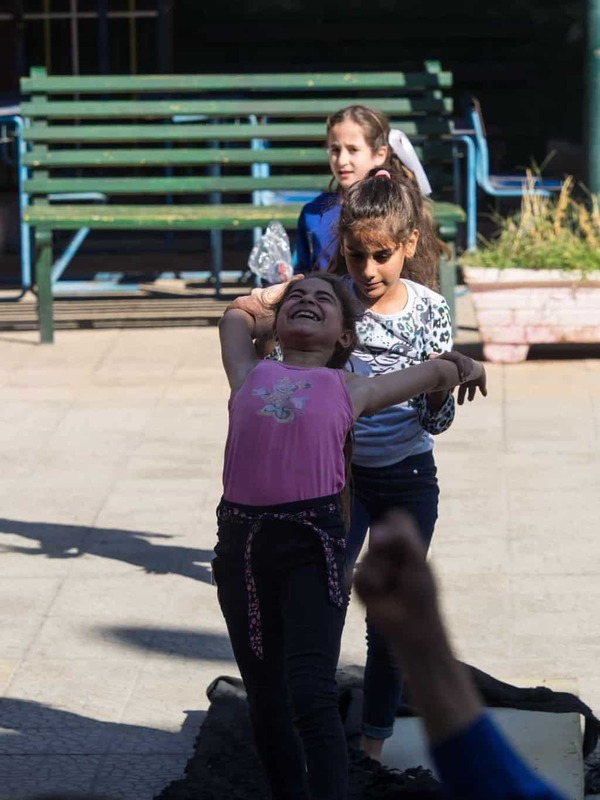 I will also include the photos from the children’s school that was used by Daesh (Isis) and Al Queada as headquarters in a general post about my visit to Syria soon. After 3 eyeopening days in Aleppo was it time to head back down to central Syria and Homs. Read about my trip to Krak des Chevaliers & The Valley Of Christians by clicking this link. Thank you for posting these great photos and very interesting commentary. I envy your trip. You seem to consider yourself a brave adventurer but in reality you are being a tourist and having fun in a country that has suffered immensely. You seem to think you are a Syria expert because you were there ten days. My family is from there, some still there and many had to flee for their lives, from both Aleppo and Damascus. I feel that you are sugarcoating the problem there is glossing over the fact that millions had to flee Aleppo. Just because you have pictures of rebuilding doesn’t undo all the years of destruction experienced.the media didn’t “lie” about that as you claim. What exactly are you trying to prove? That everything in Syria is fine? Do you have any idea about other cities besides the ones you visited? I’d appreciate some more responsible travel writing. I’m really annoyed with your comment to Cherene. It’s like you’re telling her what you saw in 10 days is worth more then her life, families life and intimate knowledge of the city. You have taken part in War Tourism, which is as bad as human tourism (minorities, tribes and marginalised). I think you REALLY need to review the tone you’ve written responses in, clearly you’re defending yourself which you have the right to do but don’t disregard others or pretend that you know more then locals when you really only know 10-days of backpacking. Also your incredibly disrespectful post to Anjci makes me wish I’ve never clicked on your post. There are people whom dedicate their lives to geopolitical studies, conflict resolution and the UN peacekeeping process, sadly your 10-day experience does not match up to this so PLEASE reconsider the tone and way you say things and the way you treat the people who post on your blogs, don’t be so aggressive. what´s disrespectful? what about all the Syrians that are still living in Syria that commented on this post the Damascus post that´s completely different from what she said? Have you ever been to Syria? No, i don’t think so. and I’m going back there in April, July, and October. Go to Syria yourself and visit and you might get a different view on things. 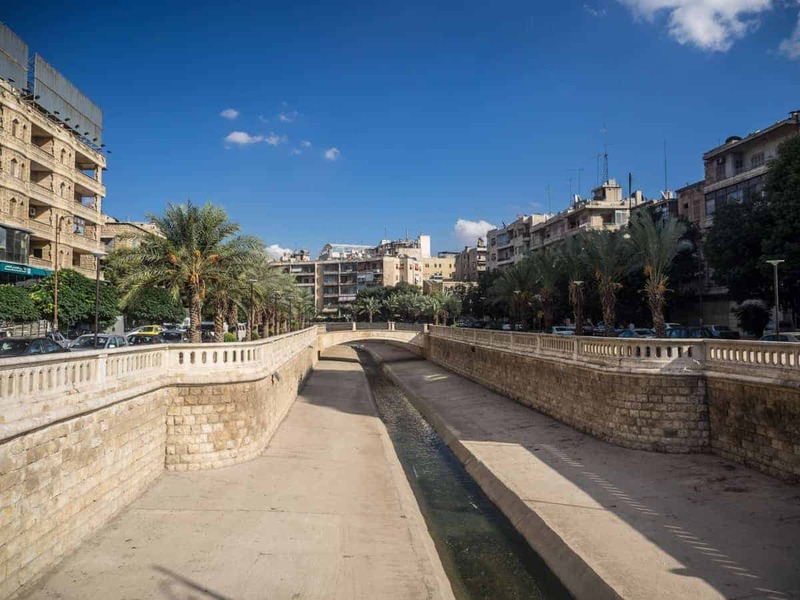 well my friend, first of all lucky you you got to visit damascus, i was with a friend once in bab touma square and a french tourist asked me directions to the ommayad mosque, so i offered walking with him there and he agreed, while on the way I told him which is better Damascus or Paris ? he said, if only you know how lucky you are to live here you wouldnt be asking this question! and yes ! life is getting back to its normal beat, eventhough the country is economically weakened but i think after 8 years of war its a normal thing, perhaps this country is doing better than some of its neighbors that have no war at all and they are suffering economically. 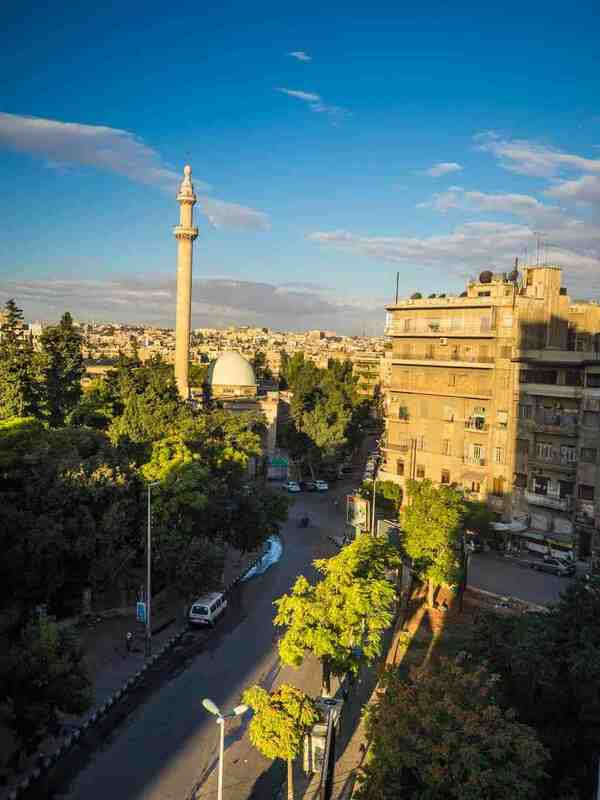 Damascus is absolutely the most beautiful city and anybody says its not, he is a hater ! even if he pretends he is syrian. I would agree, I prefer Damascus over Paris as well, yes unfurtuently so are the economy not that good right now, but I think that will change to the better very soon, especially now that the border with Jordan is open again and trade can continue between Syria and Jordan, that will improve the situation a lot. There are also daily foreign tourists arriving in Damascus these days, so that will also help to improve the situation alot. You are probably against the government and that motivates you to deem everything black and bleak. what exactly are you suggesting? that no tourists should visit syria and enjoy their time there because people there suffered 6 years of war? people in syria had enough war and its time to rebuild and enjoy every single moment to compensate for the past years. The media, specially the MSM media that you are defending, were catched with their pants down in many of the events in syria. from the very first momenets when they started supporting the unrest caused by the “Arab spring” to their bloody biased reports from aleppo, where they reported the suffering of less than 500K civilians held hostages by the Islamist groups every day for almost 3 years, while ignoring that the majority (2,5 million) lived in west aleppo under the government, not even a single report on the destruction caused by the islamist rebels and their Jahanam cannons or tunnel bobs that destroyed most of the historical areas in aleppo. 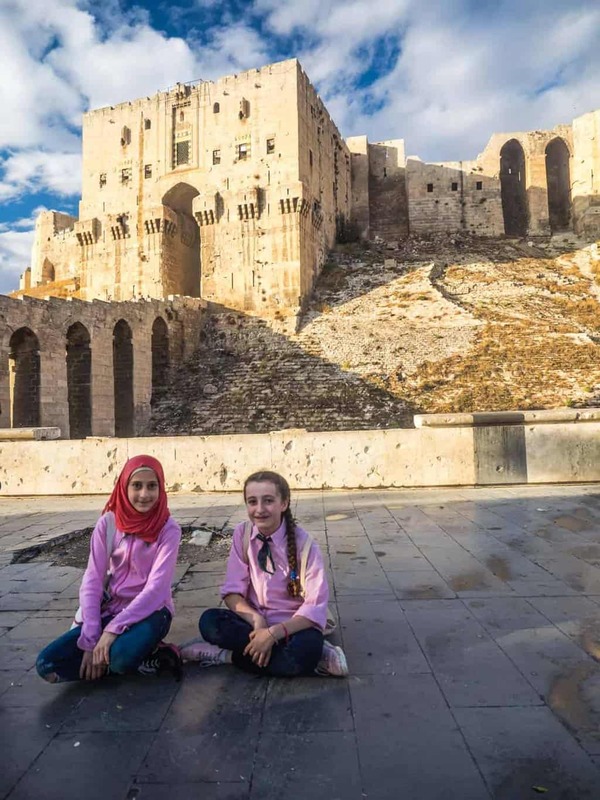 Anyway, people of syria wont need your pessimism, a tourist who is courageous enough to visit syria and give a blink of hope is what syrians need. Thank you, Cherene – I am so glad someone was brave enough to say this amid what you rightly point out as “sugarcoating”. I am amazed how many backpackers on tourist visas suddenly decide they are experts in very complex matters. And, Christian, sorry, but girls were never formally required to cover their hair in Syria – the question is whether the unwritten family pressure is enough to make them do so. 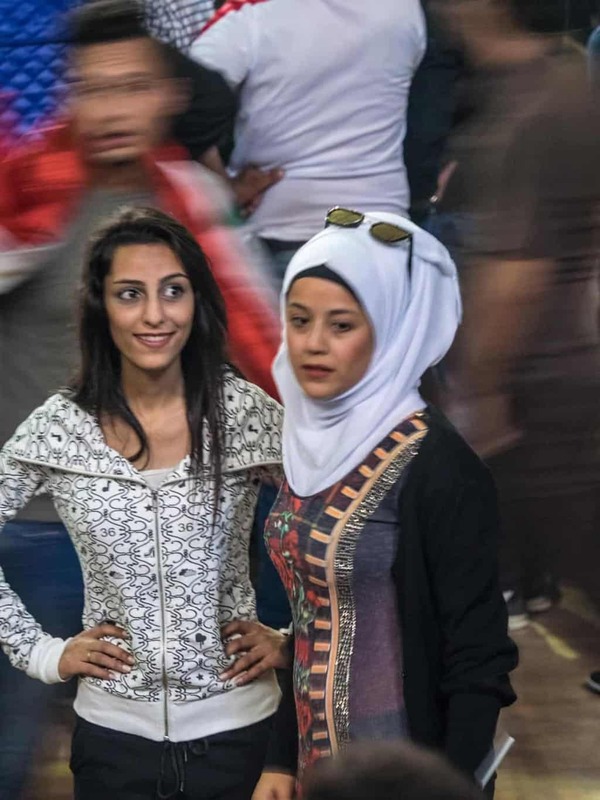 Young girls wear whatever they want and dance even in Saudi Arabia, though, if Daesh is your benchmark, then these are definitely great freedoms. 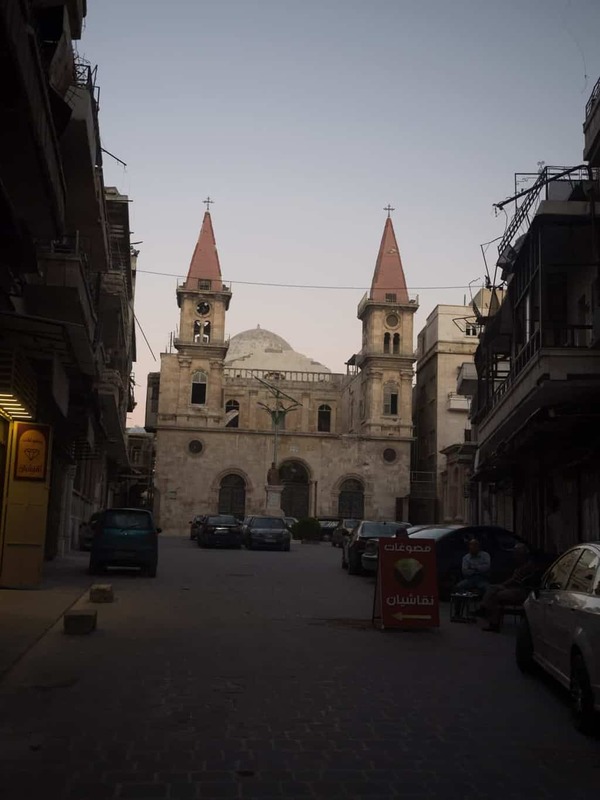 Syria has had a Christian community for centuries, allowed to worship in churches. I could go on and on but I do not have such time. I would advise you to do a little more research before posting – though, looking at the readership numbers and online comments, 95% of the audience doesn’t seem to care. Happy travels! 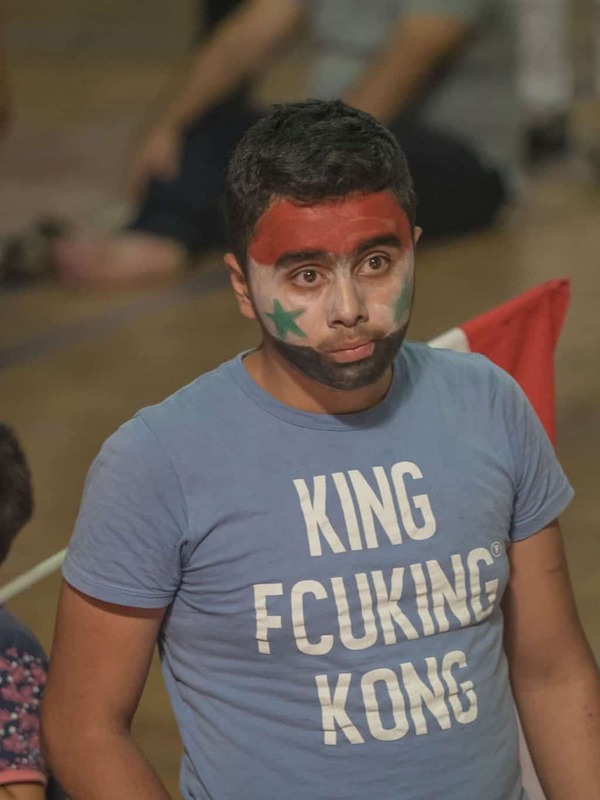 I have no Idea where you are from but don’t you think it´s funny that the people criticizing the posts from Syria, is the NON-Syrians, but the people that thankful for that I visited Syria is actually Syrians. So who to actually believe, Syrians or Western people that never been to Syria? Excuse me, there it goes in my bad english. I think Christian, like me, is the kind of man that prefer look the reality thorugh himself. So, if he can look people rebuilding Alepo, why has he to hide this information. has someone here looked pictures like these like here in the big media?. Maybe many times big medias don’t lie, but yes every time they hide information, because as in every war, media take part of the conflict. I wanted go Syria, in Turkey fascist policeman took me of my neck, and in Lebanon they didn’t give me the visa. So I’, proud of Christian because he reached it. I hope in this trip around the world, before returning Argentina be able to go there of any way. So, again, good for you Christian because you chose leave from “The Matrix” and look the world (this wonderful terrible world) and when i looked your picture about the man repairing Aleppo, I thought in my idea about if I could get there and to have a long visa, to help people in rebuilding that wonderfull country, even a short time. I’m not be part of any warring side but I prefer the Syria before war (Syria with Assad) than Syria with terrorist enemies of the humanity. So, Syria HAVE TO BE rebuild. My best greetings my friend!. It’s like tourists going to North Korea and shown by the totalitarian regime the places that they can see and visit. The difference is that those tourists never buy that from North Korean government – and Christian buys everything from the Syrian regime! Come on man! Think! You don’t have to ask people to give you a report if they don’t believe you because it’s all over the media for the past years. 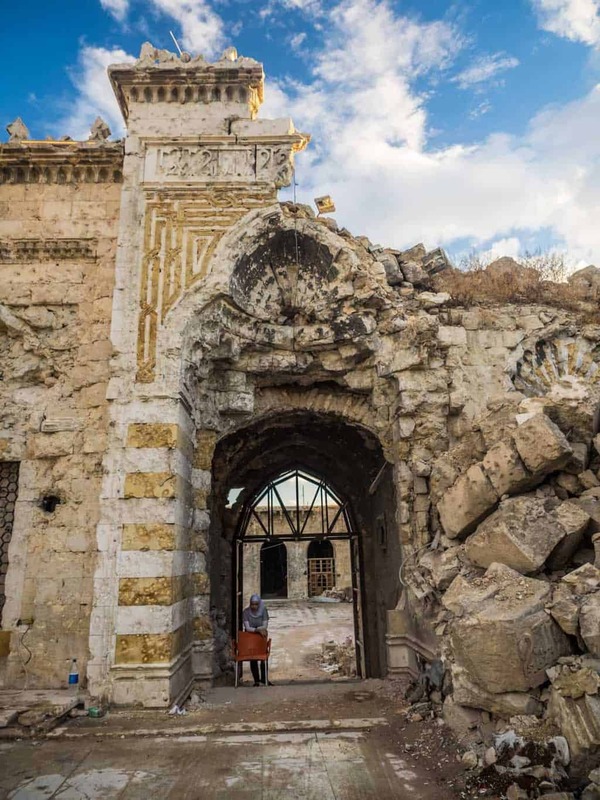 Go to Idlib, go to Hama and go to Home, but staring at a destroyed city being rebuilt barely reflects the kindness and generosity of a regime that destroyed it. Imagine, you tax the people, the business and all that. And now they shrivelled under your military might, what will you do? You will probably just rebuild the place and get on with life, try to forget all those this terrible govt had done to you. And for God’s sake, for anything’s sake, put some real accounts of discussion with Syrians. Ask them what they think about the regime (I noticed there is none in your account), stay off the tourist trail and go talk to someone in Hama. Taking photos of beautiful women doesn’t only not help and is no way reflecting the real condition – and to be honest, it’s seen as rather rude in this part of the world. That show you got no idea what your talking about, when going to North Korea so the northern Korean government get everything, while going to Syria so do the government there get nothing. The locals in shops and hotels the money while in North Korea so are everything included.. So Syrians I talked to in Homs and Aleppo Is not real Syrians? I totally agree with your response to Christian. Well said. You are clearly too emotionally involved – and it shines through your writing. I read your comments and then re-read the article to see if there was any substance or validity to your criticism. I found none. And moreover, I think Christian/UT gives a much fairer (and better) impression of the Syrian people than the media these past years, who just label them as pure victims – and not the strong and persistent people they are. I a world of political correctness and “truth by consensus”, we need travelers and reporters like Christian – who are skeptical of both sides, and has no political agenda. You, Cerene, should take notes. Yesterday, 1/11, I was also in Aleppo, or Halab in Arabic. In an other we two swedes maybe had met in the old town or at the castle. And as you, I was in the same restaurant with the red Mustang outside ? I look for the chance to visit Syria. The Sirians are lovely people and it is great to know that the damage is smaller that the news keep showing us. Hope this nation recovery quick and find peace. This is treasure, to be honest, to know about such places from a common person’s perspective and first-hand info without any invested interests. Love from Pakistan. wow this was so interesting. Did you need a special visa to enter the country? I assume you must have also hired someone to specifically take you around the country..? 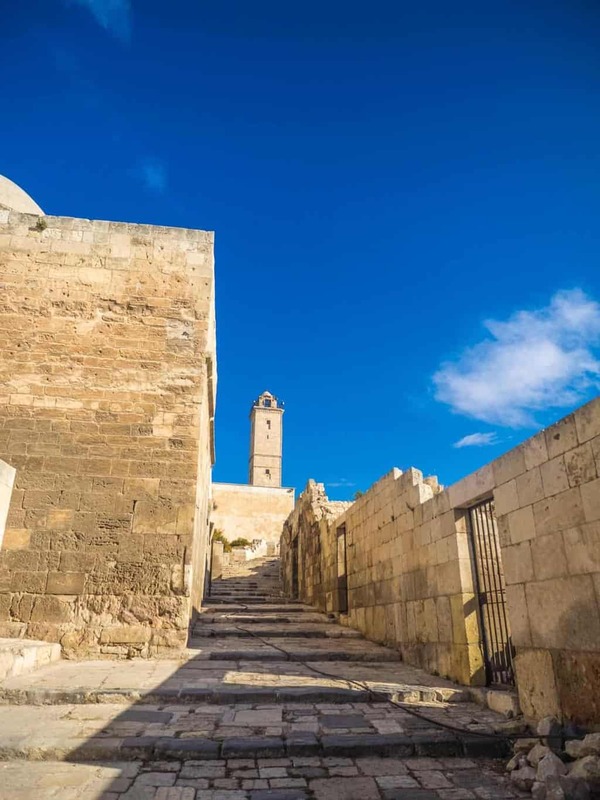 I have never seen any blog posts before about visiting Syra for tourism…. thanks for sharing this very interesting story! How’d you get your visa? I noticed that you did not accept my comment. You are only replying to people who don’t challenge you. I get it. I am also a travel blogger but I respond to people like myself, who actually have ROOTS in the country I’m writing about and acknowledge the validity of their concerns. I think that is irresponsible as a travel blogger to show only one side of a problem….to encourage people to visit a potentially dangerous place when they don’t have the full picture. You are not a journalist…you don’t know what really happened in Aleppo. I had reports from my family who was there. It was pure hell. The media didn’t lie as you seem to imply. There are two Aleppos…the one where life was normal…the one under Assad’s control…the one you are seeing. The other…was devastated. It wasn’t just a minor segment as you also imply. To minimize all the suffering that happened…makes me wonder what you actually learned from this trip other than to spread propaganda. All these people commenting that they want to know how to go, how to get a visa…you really think that’s a good idea? Again, think about the responsibility you have when you are influencing people. I doubt you have the guts to let my comment be published or to respond but I hope you read this and think about it. The reason why you comment hasn’t been posted is coz I been offline for a few days traveling that simple. Here´s a FEMALE traveler that recently have been to Syria as well https://theadventuresofagypsy.wordpress.com/2017/10/18/youre-going-to-damascus-you-cant-be-syrias/ So you think everyone that visit Syria is lying about that it´s safe? I went all over Aleppo, also East Aleppo and meet with families that lived there during the heaviest of the war. I will post a lot more in a future post. Since your a travel blogger as well and with roots from Syria, GO there yourself and see with your own eyes how it really is. So why are tens of Syrian´s thanking me for my photos, that someone finally are posting how it really is there? It’s a beautiful city, If it had fallen n the hands of rebels it would be sharia now and 0 freedom. Did you notice a big military presence ? Is ISIS nearby ? What about the rebels and prisoners of war, did heat anything about this? No, i didn’t notice any big military presence at all, only on the outskirts of the city. In central Aleppo nothing. ISIS is no longer in this area of the country. But while I was there so did ISIS attack the road just after I passed by it. You mean the terrorists? Yeah I heard a lot of horror stories from people that lived in their areas. holding back food, using them as human shields, daily rapes etc. you don´ get it, do you? It is not about the past, it is about the present. He never denied that the war has been hell for many people. But fact is, official media in Europe, especially Germany tells us, that most of Aleppo is destroyed and they keep manipulating the situation. Christian, as one who was born and raised in Aleppo in a home just across the central park, I thank admire your courage for visiting Aleppo and reporting your impressions. Had the Syrian government produced this post, outsiders would have thought it was government propaganda. I really loved Aleppo and I can´t wait to go back again, and see how far rebuilding have come when I visit the next time. Hello, Giovanni from Italy. I visited Syria in 2009.Visited Damascus, Aleppo, Palmyra, Homs, arrived to Deir Ezzor and spent a night there. Took fantastics pictures. 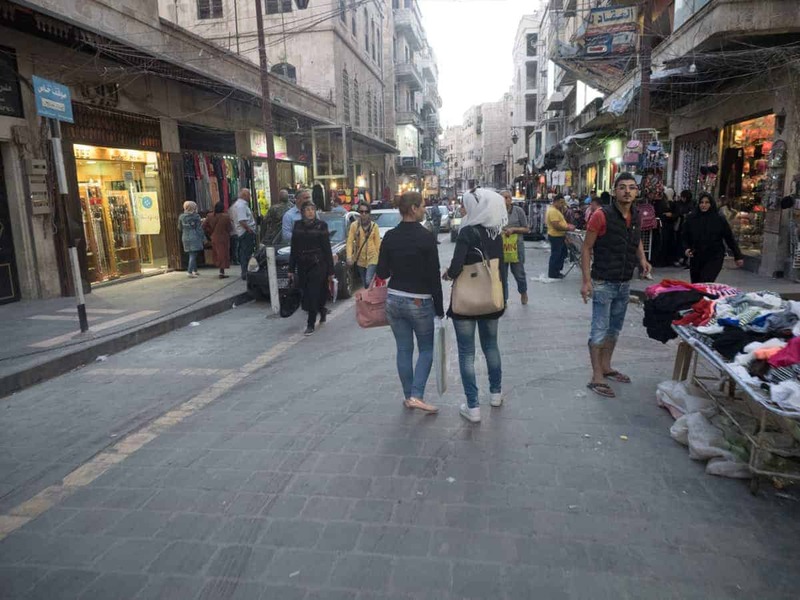 Happy to see hystorical part of Damascus is unchanged. Aleppo souk was fantastic, unfortunately it has been destoyed. Watching your pictures seems all around Aleppo historycal part bombs destroyed all; there were old Quran schools there. The big loss is the Aleppo mosque. When I went in 2009 (with my girlfriend, a rented car I drove around Sirya and a paper map ) they were about to finish the restoration…. I hope to come back one day. 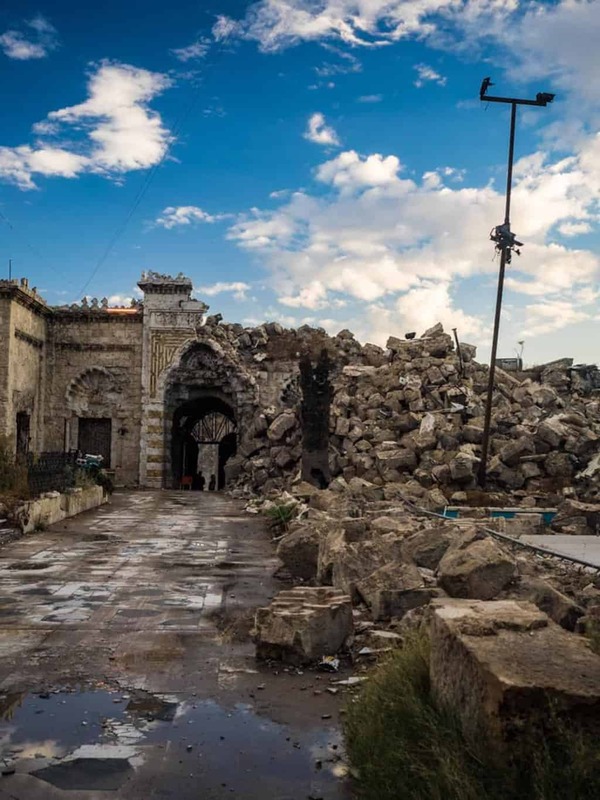 Yeah the loss of the Aleppo Mosque is a huge loss, but it will get rebuild, it will never be the same, but it will be close to its former glory. I tried to visit Palmyra and Deir Ezzor but my visa was about to expire when I got the permit to go there, but two other foreigners (one German and one American) I meet managed to visit both Palmyra and Deir Ezzor. So hopefully I will be able to go there next time. You didn’t publish my comment, well… let’s try again. Aleppo is safe today, no dout about that. The problem is the the way you tell a story of gouvernement vs terrorist, that’s very inappropriate. How dare you treat a whole people as “terrorists”, what the hell do you know about that ? When talking to locals the survived the war in Aleppo and lived in East Aleppo and hearing their stories. Where did I call the whole people as terrorists? If you visited Syria with no bias, can you explain why you promoted your posts to pro-Assad Twitter accounts? Did you speak to any of the thousands of internally displaced people, any of the prisoners of the Assad regime, or visit Ghouta? 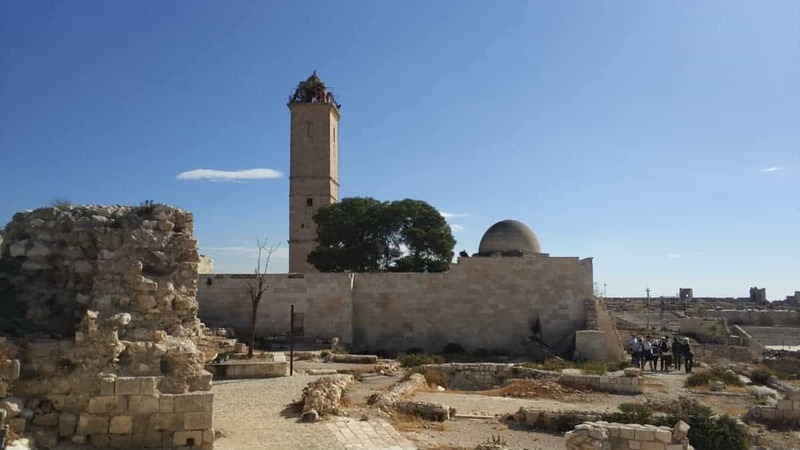 The Umayyad Mosque’s minaret was probably destroyed by government forces, since the mosque itself was under rebel control at that time, but only some hundred meters from the front line. In any case there is no definitive proof that it was Al-Nusra that blew it up like you stated (and for what reason? since it was their turf and an excellent vantage point). I don’t support the “rebels” at all and fully agree that the media hysteria about the battle for Aleppo in its last stages was shamefully misleading, but I have an equally intense dislike for “Assad did nothing wrong” narratives. Blame where blame is due. Otherwise kudos on the visit, I was considering visiting Damascus from Beirut a year ago but decided not to due to time constraint and not knowing the situation on the checkpoints (I feared corrupt guards). Can I take your pictures to use on my blog? Are the pictures licensed under CC0? I would link to your blog of course. Yes you can use my photos with linking to my page. Many thanks to you, Chris. I will proceed it in this manner. ich bin leider nicht so sprachgewandt, deshalb mein Kommentar auf Deutsch. Danke für die tollen, wunderbaren Fotos. Es ist wie eine Befreiung, solche Bilder von Syrien (Damaskus und Aleppo) zu sehen. Bei Epoch Times hatte jemand im Kommentar einen Link auf Deine Seite geschaltet. Jetzt brauche ich erst mal frische Luft. Es ist so, als hätte ich es immer gewußt! Als über uns (Eisenhüttenstadt u. Frankfurt/Oder über die Oderflut (“Jahrhundertflut” 1996)) berichtet wurde, rief mich meine Cousine aus Nürnberg an, um mir zu sagen, wie leid ihr das tut, dass es uns nun so schlecht geht. Ich mußte so lachen darüber, da sie keine Ahnung hatte, dass die Oder ja nicht komplett durch Eisenhüttenstadt floß und nur die Gärten auf den weiten Oderwiesen etwas betroffen waren. Wie werden wir hier in Deutschland belogen und betrogen, da bleibt einem die Luft weg!! Was machen die Syrer hier bei uns (ich wohne neben einem zentralen Aufnahmelager für 5000 Menschen und es ist voll!) ? Sie dienen lediglich dem NWO-Programm der Völkervermischung und der Zersetzung Deutschlands. Im Prinzip sind sie auch nur Opfer, die Täter sitzen – wie immer – ganz oben und Mutti Merkel ist auch nur deren Marionette. Liebe Sybille, wenn Sie direkt neben einem Aufnahmelager wohnen, gehen Sie doch mal dorthin und unterhalten sich mit den Menschen. Dann würden Sie z.B. Erfahren, dass Syrien nicht gleich Syrien ist. Bei den in diesem Bericht besuchten Gebieten handelt es sich um von Assad-Truppen kontrollierte Zonen. Dort konnte man auch während des Krieges einigermaßen in Sicherheit leben, die Zerstörung ist nicht so groß wie in anderen Gebieten. In anderen Teilen des Landes sieht es dagegen ganz anders aus. Auch die Städte selbst sind in verschiedene Sektoren unterteilt, wie man oben auch lesen kann. Es ist daher so, dass manche Stadtteile in Trümmern liegen, während andere nahezu unversehrt sind. Sie werden sich nun Fragen, warum die Menschen dann nicht einfach in die unzerstörten Stadt- oder Landesteile ziehen: Innerhalb des Landes, aber auch innerhalb der Städte, gibt es Straßensperren: Für einen Kurden aus dem Norden Syriens ist es z.B. nahezu unmöglich, nach Damaskus zu reisen. Er würde an einem der Checkpoints entweder nicht durchgelassen, verhaftet oder von Assads Männern zwangsrekrutiert werden. Auch in Ihrer Heimat in Nordsyrien sind die syrischen Kurden übrigens nicht sicher: Bereits vor dem Krieg war es ihnen verboten, ihre eigene Sprach zu sprechen. In Schulen durfte kein Kurdisch unterrichtet werden. Das Lesen eines kurdischen Buches oder der besitz einer kurdischen Flagge wurde mit Gefängnis bestraft. Dch auch vor den eigenen Leuten sind die kurdischen Menschen nicht sicher: Hier droht volljährigen Männern u.a. die Zwangsrekrutierung durch kurdische Truppen. Zudem werden die kurdischen Gebiete in Syrien von der türkischen Armee bekämpft. Dies sind nur einige Beispiele, an denen Sie erkennen können, dass das Leben in Syrien nicht ganz so einfach und sicher ist, wie es dieser Reisebericht glauben lassen möchte. Dear Sybille, if you live right next to a reception center, go there and talk to the people. Then you would, for example, learn that Syria is not equal to Syria. The areas visited in this report are zones controlled by Assad troops. There you could also live in safety during the war, the destruction is not as big as in other areas. In other parts of the country, things look very different. The cities themselves are divided into different sectors, as you can read above. It is therefore that some neighborhoods are in ruins, while others are almost intact. 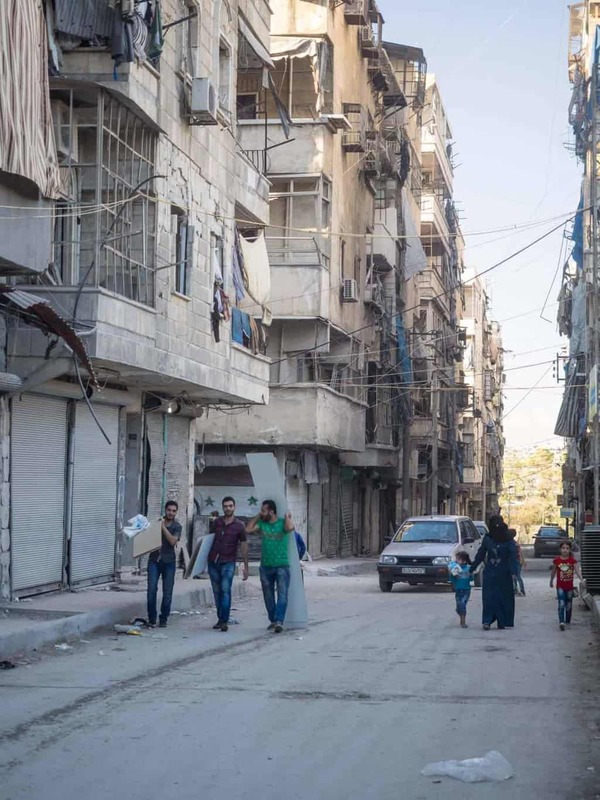 You will now ask yourself why people do not just move to the undamaged parts of the city or the countryside: within the country, but also within the cities, there are roadblocks: for a Kurd from the north of Syria, for example, there are roadblocks. almost impossible to travel to Damascus. He would either not be let through at one of the checkpoints, arrested, or forcibly recruited by Assad’s men. Incidentally, the Syrian Kurds are not sure that their homeland is in northern Syria: even before the war, they were forbidden to speak their own language. No Kurdish was allowed to be taught in schools. Reading a Kurdish book or possessing a Kurdish flag was punished with imprisonment. Even in front of their own people, the Kurdish people are not sure: Here threatened men of age, among others. the forced recruitment by Kurdish troops. In addition, the Kurdish areas in Syria are being fought by the Turkish army. 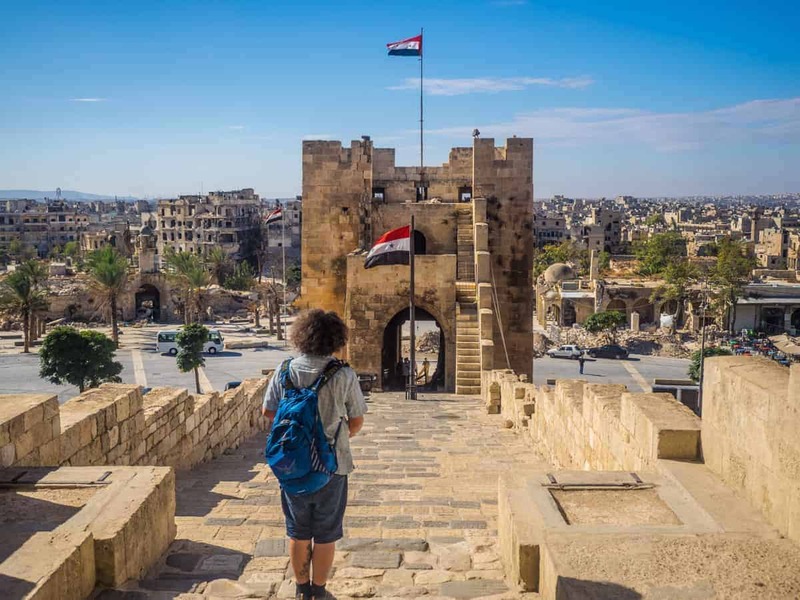 These are just a few examples where you can see that life in Syria is not as easy and safe as this travelogue would have you believe. Hi Christian, excellent article! I loved your photos and it was very informative. 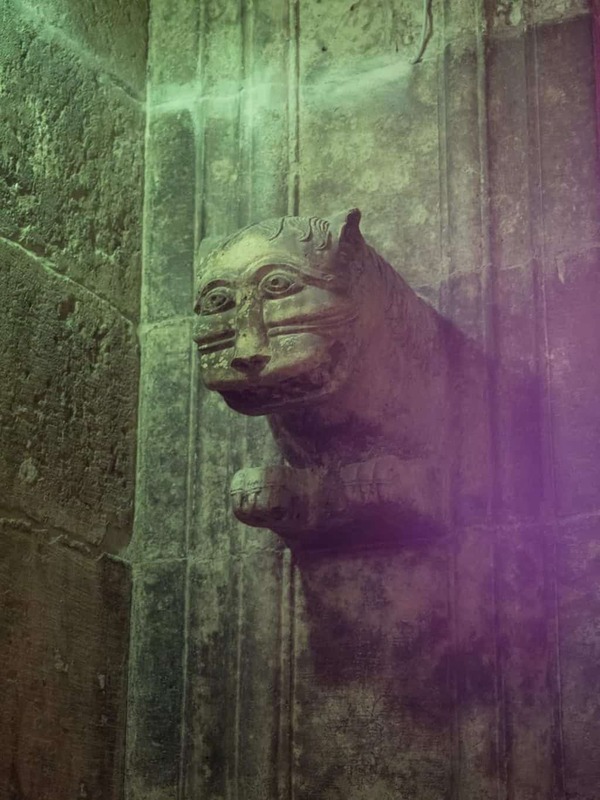 I stumbled onto your blog by accident and your Syrian articles really caught my attention. I’ve been wanting to get into Syria and visit but I can’t find any reliable visa information anywhere. 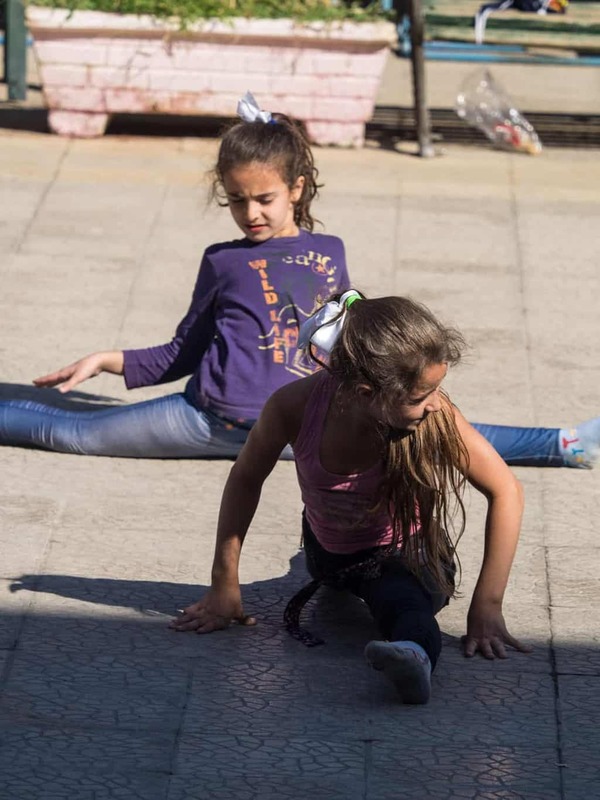 I was just in Beirut in September for a few days and missed my window to take action as my time was limited and I was afraid I would be denied entry at the Syrian border (again as I had no reliable information). Where and how can I apply for a Syrian visa as an American? Thank you for the advice! I’m not sure where Americans can apply, but I will contact the two American tourists I met in Syria and ask them to reply here about getting the visa. I did take me almost 10weeks to get my visa. I did email the Syrian embassy on Friday and they told me they could issue tourist visa in 4 to 8 weeks, so it seems like it´s getting easier and faster these days. Ich versuche es noch mal in deutsch. Das ist ein faszinierender Artikel zu Syrien mit ebenso ausdrucksstarken Bildern. Ich selbst beschäftige mich seit Jahren mit Syrien, ohne jemals dort gewesen zu sein. und ich würde mich freuen, wenn ich zukünftg – unter Angabe Ihres Blogs – diese Bilder verwenden kann. those who fleed from Syria to come to Germany are mostly Daesh terrorists or just say they are Syrian when in fact their are not…and those people just want to live of welfare! Ich war beruflich in den letzten Monaten 3x in Damaskus und fand es klasse. Ich habe mich wohl und sicher gefühlt. Warum wir in Europa immer noch subsidiären Schutz bewilligen ist mir schleierhaft. Zumal alle Kollegen aus Syrien mir erzählten das der Großteil des Landes nichts vom Krieg mitbekommen haben. I am a syrian who lives in Norway. I want to say thank you so much for these beautiful reflections u made and how deep your insight is. Fantastisk. Hello Christian, have you visited the museum in Aleppo and if so, how is its situation? I did not visit the Aleppo Musem. It was closed and It´s currently undergoing restoration. Almost every historical artifact was evacuated from the Museum and kept in safe places by the staff at the museum before the war escalated, I got told that when it reopen will it still have more than 95% of the artifacts it had before the war broke out. I am a brazilian citzen living in Portugal and will spend a month (March 2018)travelling between Egypt , Jordan and Lebanon. After reading your posts im really considering a road trip to Damascus from Beirut. I dont think i would face too much trouble when crossing border. Im more afraid about my car being shot along the road. The road between Jordan and Syria is closed, since the border crossing is not in had of the Government. While Traveling between Beirut and Damascus is absolutely 100%safe, so Is there no way you can go from Jordan to Beirut overland these days. Igor, somos dois. Estou planejando ir em Abril. É uma pena que você vá em março, o custo fica bem menor indo em grupo. Abraço! thank u Christian,,,,, |Aleppo will never gonna be a city of ruins. Hello Christian, thank you for sharing this with us. 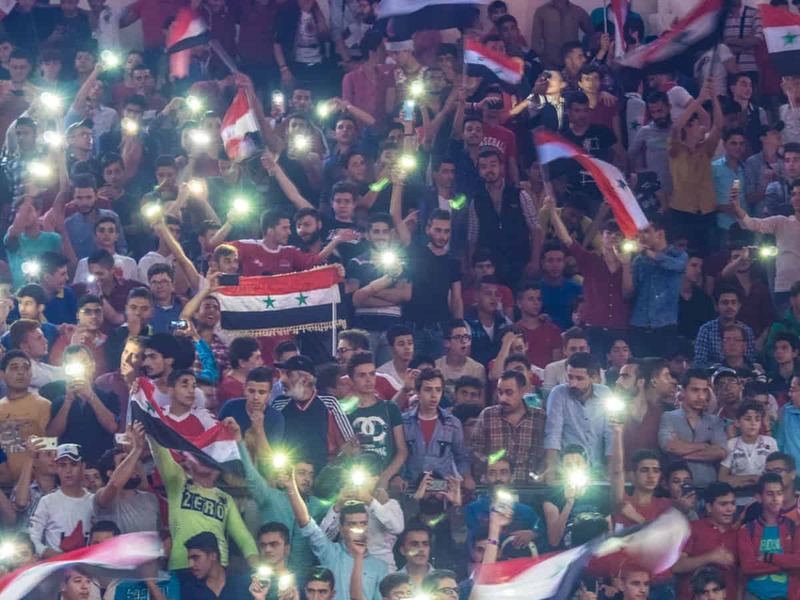 Im really happy Alepo (and soon all Syria) is finnaly free, happy that people returning to normal life, life before isis destroy this amazing country. Syrian people deserve to live good like they live before this horible war. All the best from SERBIA. Serbian people honestly love Syria. I’m from Aleppo and I’ve been living in France for 5 years now. I would like to thank you for the photos. 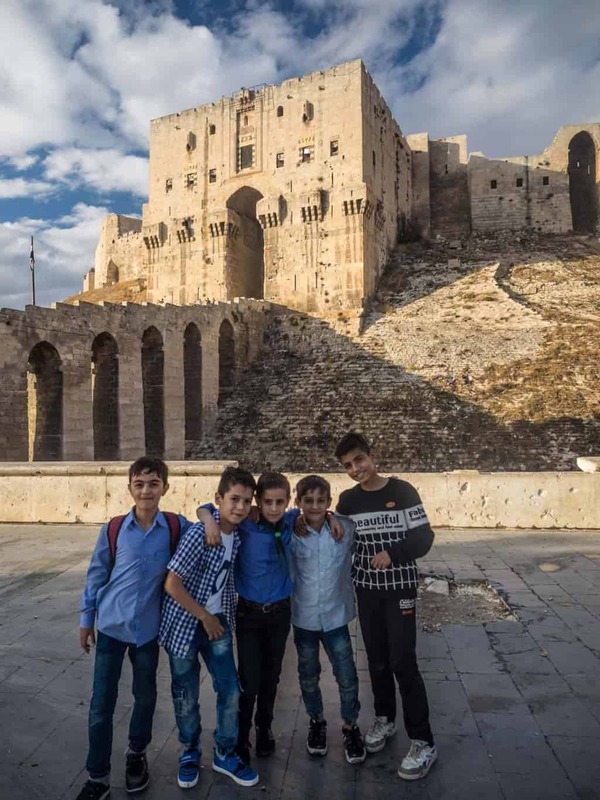 Always nice to see tourists visiting again this beautiful country 🙂 These photos brought me back very nice memories and hopefully I’ll return back soon to my beloved Syria. Thank you for your travel report, from your trip to Syria. It’s really friendly, informative and interesting reading, and your pictures are really great. My husband and I are planning our first tourist trip to Syria, until April 2018. Unfortunately, we did not reach the country before the war broke out in 2011. It is really uplifting to read that it is safe to travel in the country again. We are Danish and live in Denmark. We plan to fly from Copenhagen in Denmark to Beirut in Lebanon. Then we will rent a car in Beirut and drive to Damascus. After on day in Damascus we will drive north to Alleppo. I will ask you, if you can recommend to rent a car in Beirut and even drive to Syria up through the country. 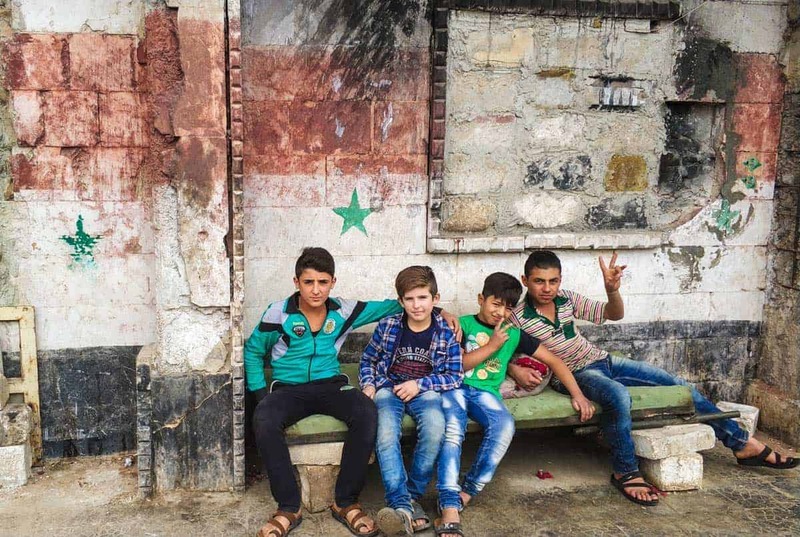 Is road safety in Syria stable enough to selv-drive, or is it too risky? What would you recommend Chris? Heey Cecile. Sorry the late reply, but been super busy with work after Xmas Holiday. 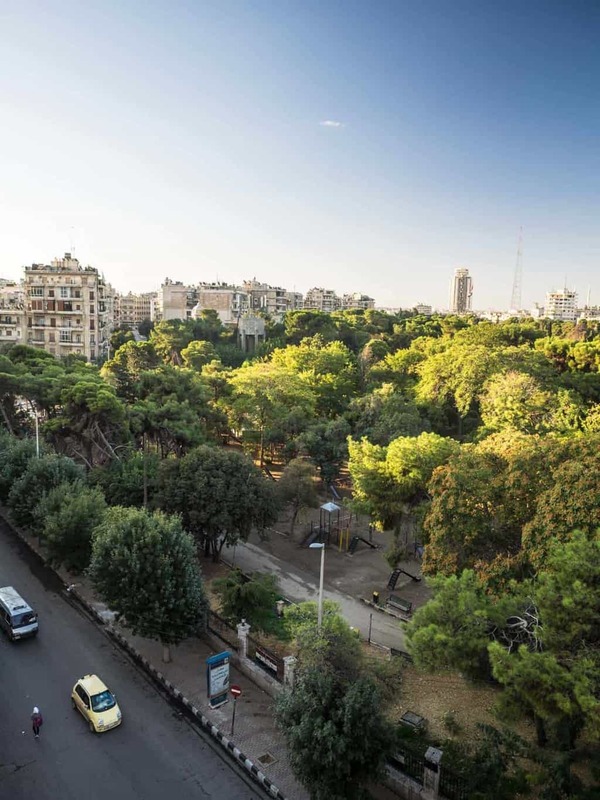 For safety reason so will there be safe to drive yourself from Beirut – Damascus – Aleppo. 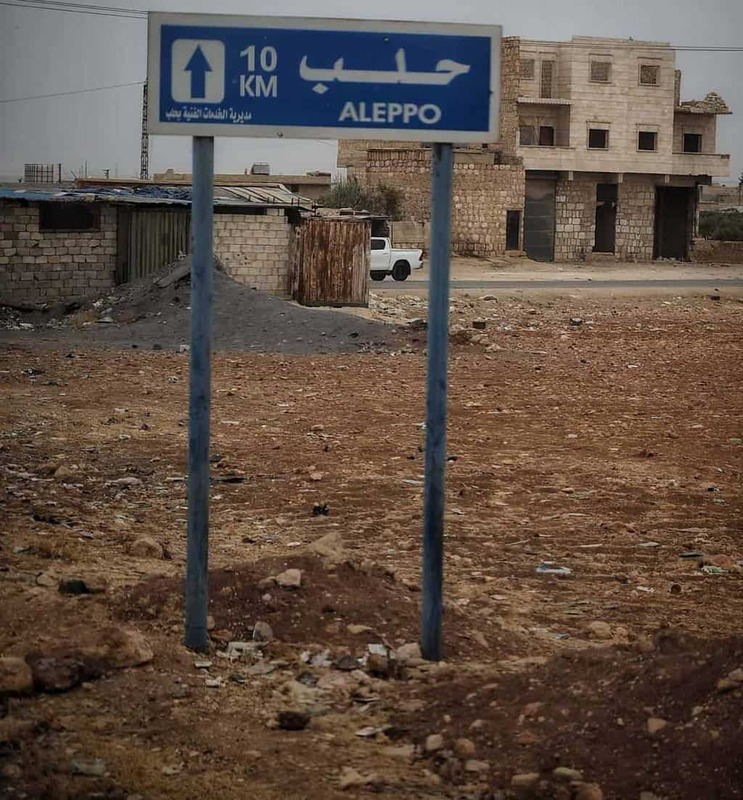 But You might need a special permit to be allowed to drive yourself, there´s a lot of military checkpoint on the way, especially between Homs and Aleppo along the Itira – Khanasir road, the soldiers at the checkpoint are super friendly and it rarely takes more than a few minute to clear them. I’m most likely going back to Syria on April again to. I did´t see any car rental´s in Syria, so I have no idea where you can rent a car there, but Im sure the hotels would be able to help you. If you will not be allowed to drive yourself between Damascus and Aleppo so is it pretty cheap to hire a car with driver to take you there. All hostels in Damascus can help you with that. Have you managed to obtain the Syrian visa yet? I have been talking a lot with the Syrian Embassy in Sweden, and the visa process should be faster and easier soon. Man, your post totally made my day! Thank you soooo much for sharing this experience! I don’t think I would go there. Maybe in a few years after the war is over, but it seems foolish. Especially since I am carrying a US passport. I would possibly be killed or kidnapped there if certain groups had the opportunity and I would have either have to die or pay a ransom. Neither of which sounds like fun to me. I’m not trying to risk getting my head cut off even if there is a .001% chance. You even said yourself the road you were on was attacked 1 hour later after you were on it. That is extremely dissuading me to go to visit. Even though I am Muslim I don’t think any Al-Qaeda takes kindly to any American citizen. For some reason, I just think it’s unlikely that if I ran into them we would just have a tea and conversation and I would be on my merry way. I could go to any other place in the world minus a small handful of countries and not have to be stressed out about that. I’m planning to visit Lebanon for a couple weeks and know some people who took the trip to Damascus from Beirut, but they had a reason… to visit their family members. I have been to Iraq before and I would go there again just to visit friends but I’m not totally sure of the security situation so I’m going to wait for the time being. I also don’t want to have to deal with elements in my own government who would be very suspicious and not understand the reason I would have to go there (tourism/visit). I was already detained entering the US from Turkey and have been denied entry to Israel only for visiting Egypt, Turkey and Iraq. Even though this was a mistake on the part of these countries (US and Israel) security agents I don’t want to have to deal with this kind of hassle again and I surely would if I have a Syrian visa and stamps on my passport. I think it’s dangerous what you did and a little bit crazy and I’m curious as to why. Couldn’t you just let the Syrians sort out their own problems and wait until the war is over? Why visit now? I mean I’m glad you made it back safely and I hope you had an overall positive impact on the people and the situation in Syria although from your post it’s hard to ascertain. I might have to read your blog more! Any way, safe journeys from a fellow traveler. For now, until the situation improves, I believe Syria is a destination more accommodating to terrorists than tourists. Holy smokes, that was a hostile response to a reasonably built comment. I am European and well travelled and I would be terrified to be in any country with such high level of recent destruction. I think you went a bit too far comparing New York to Aleppo. I applaud your boldness going to this kind of places, but you really cant compare it with first world metropolis that are not in that state of conflict. I’m sure you meant well with this post, but your writing shows a lack of understanding of the political situation and the way a dictatorship functions. Do you expect people who live under a regime that will torture and kill them for any dissent to say anything but positive things to you when you visit as a Western tourist in a government controlled area? This is not a place where people have access to free speech or a balanced education about what is going on, and a huge number of Syrian citizens are no longer even in the country. You should also make an effort to talk to a wider range of the millions upon millions of Syrians displaced from their country around the world – maybe they would have a different story to tell. I’m linking you to Western news sources here because they’re written in English, but happy to provide you with many other resources by people from the area if you’d like more information from whatever sources you find most credible. If you’re going to visit a place where countless people have been murdered and tortured, and continue to be, you should approach the situation with more nuance and research what you’re talking about – this is a very serious situation, and I don’t think this trip has taught you as much about what’s going on as you think it has. I respect your efforts to travel to lesser known places, so keep trying to explore and try not to take things quite so much at face value! All my best. All ın all thıs guy ıs nothıg but a blogtrotter. All he fınds attractıve ıs hangıng around streets, gettıng ın and out of bazaars, souks whatever. I know, unfortunately so have this war made me lose all trust in media, it´s actually more and more people going to Syria as tourists these days, the visa process has become a lot easier last month. And surprisingly so are everyone saying the same, that they have not much trust left in media. I’m going back soon to discover more of Syria, and to show real photos of what Syria actually looks like these days. Great story. Was this part of a tour or did you travel completely on your own? In which case did you get a bus form Damascus to Aleppo? on your website and we ask if we could use it once in our magazine for free? Of course we mentioned the copyright. Sure you can, but mention my website. Tusen takk:) Jeg anbefaler sterkt og reise, hvis du har noen spørsmål så send meg en mail så skal jeg svare fort. I am from Aleppo where my parents and most of my family remain but I now live in Canada and I haven’t been back since 2012. Your post has really touched me, I respect your courage to travel to Syria during this time for wanting to see the reality for yourself. I was shocked by a lot of the negative comments above, Syrian people have suffered enough and they need tourists like you to now report a positve and objective point of you. Everything you knew about Syria and the war before being there was probably from Western sources, and I see so many people in the comments accusing you of not knowing enough but all they do is sending links to more Western sources so I find it ironic that they think they know more. Please don’t let these comments discourage you. Part of me is scared to go back and be heartbroken by all the destruction but your post definitely made me more excited to return, hopefully this summer!